The Guardian newspaper in the UK made this rather amazing interactive infographic (click through to interact) on causes of death, conditioned on age and region, around the world. 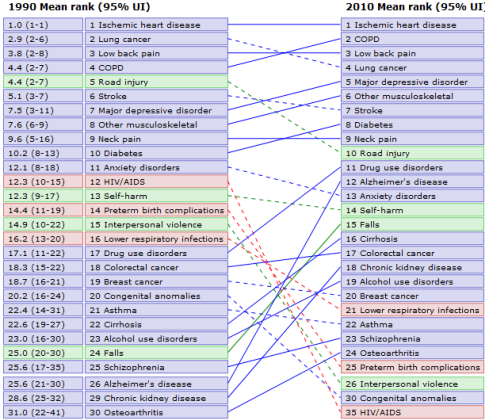 They also provide, below, a display of ranked causes of death, and how they’ve changed since 1990. How do people die? One thing that pops out is how “cardio and circulatory diseases” increase in probability with age and ultimately become the most likely cause. 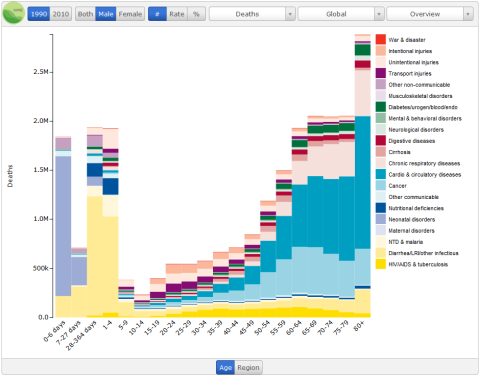 Also striking is that in a number of regions of the world, most deaths occur before age 5. How do people die? was written on August 29, 2013 and filed in Encyclopedia,Research News.